In the last blog post I said we were going to talk about how to incorporate guided practice into the lesson. But we can’t move to guided practice until we’ve finished with, “Explain, model, demonstrate” and we still haven’t talked about how to add the best comprehensible input, an indispensable component of a successful lesson plan. Input is still teacher-talk, the demonstration and modeling of proper language in context. 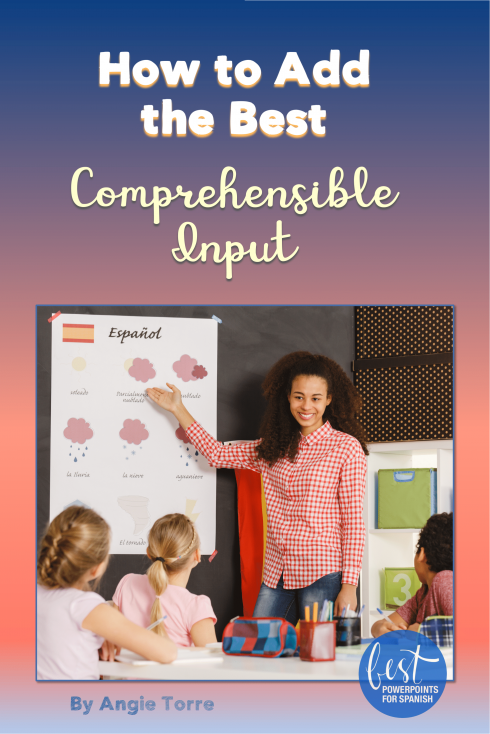 In this post we will talk about how to add the best comprehensible input so students get the necessary repetition in context in order to produce language. Because, as we all know, language is acquired through CI. If we are not inundating our students with the target language, they will never be able to communicate in that language. It is the language teacher’s primary responsibility to make the target language understood by whatever means possible: facial expressions, gestures, board drawings, dramatizations, modeling, demonstrations, intonation, use of cognates, objects…standing on one’s head. And the more compelling the input, the better because students typically hear what is interesting and will not acquire what they don’t hear. So, what strategies and activities will provide students with the necessary repetition? Listed below are a few possibilities. Choose the one that works best for your topic. Commands: Begin by immediately teaching the commands so students hear the same instructions repeatedly. Doing so will keep the class functioning in the target language and students will assimilate the high-frequency verbs they hear in later communication. Although they may not understand the conjugations, they will understand the meaning. A wonderful way to give commands is through transition songs that students hear every day. Take a look at this one by Minute by Minute Spanish. Visuals and Labels: Label all the objects in the room and refer to them often. 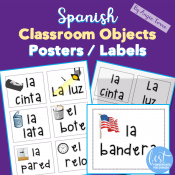 Click on the image above to see the labels I put on my CLASSROOM OBJECTS. 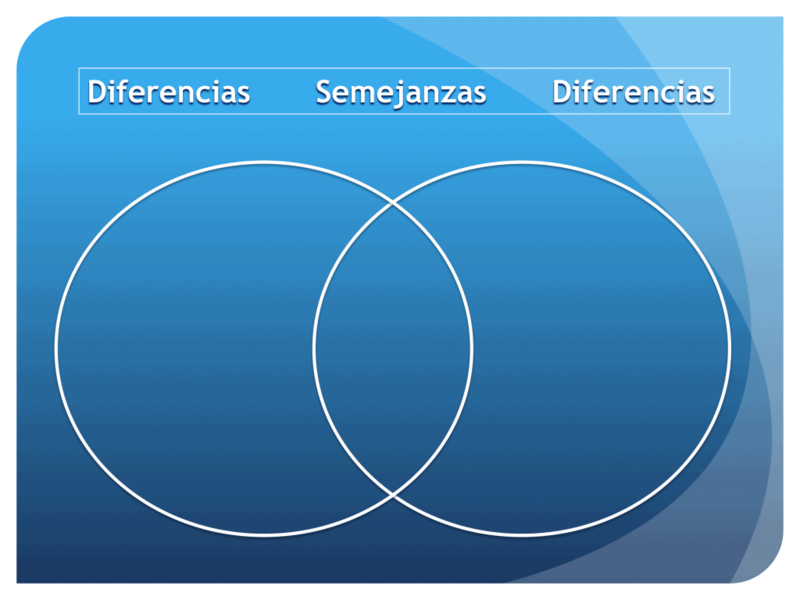 Use captivating images in your PowerPoints so that you can keep speaking in the target language without using English. Take a look at the visuals in my Spanish Adjectives PowerPoint. Objects and Realia: When teaching vocabulary, bring in real objects. For example, when teaching clothing, bring in a suitcase full of clothes and talk about them while displaying them. When teaching reflexive verbs, bring in a suitcase full of items necessary for daily routine, thereby, allowing you to use the vocabulary words in context. Storytelling: My favorite way of providing input. Students get so caught up in the story they forget they are thinking in another language, especially if the story has strong visuals. Pre-teach the vocabulary with gestures, tell the story using TPR Storytelling strategies and recycle the language with activities moving students from recognition to production. You can find write your own stories, use Blaine Ray’s Stories or find TPRS by googling your vocabulary or grammar concept. For example, “TPRS for Ser.” There are also many Illustrated TPR Stories by topic on TPT. Not proficient in TPR Storytelling yet? Click here to read a tutorial on How to Tell Stories Using TPR Storytelling Strategies. Teacher-Talk: Talk about your own experiences related to the topic. For example, when teaching clothing, talk about what you are wearing. When teaching preterite vs. imperfect tell about something interesting that happened to you, accompanied by visuals, of course. Total Physical Response: Act out the meaning of the words or expressions and have students mimic you. Games: Give students BINGO cards with images and use the words in a complete sentence as students cross off the words. Click here to see BINGO GAMES. Play SIMÓN DICE. Play PICTIONARY: Students draw what you say. Repeat the sentences multiple times as they draw. Play Jeopardy, as long as the questions are complete sentences and use the concept or vocabulary in context. Audio: Create dialogues or present audio from the internet. I created an audio activity for listening comprehension for the weather. Memes and Cartoons: I begin every lesson with a meme or cartoon related to the vocabulary or concept. I have them labeled by topic on my Chistes Pinterest Board. Graphic Organizers: Put a graphic organizer on the screen and talk about your topic. My favorite is a Venn Diagram for making comparisons. 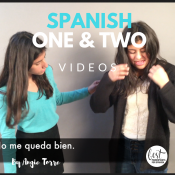 Here is one I use for the Presentación Oral for AP Spanish. to get the FREE PowerPoint. As you can see, there are many ways to repeat the vocabulary or grammar concept in context for your students. With this foundational repertoire now you have plenty of ideas on how to add the best comprehensible input. In the next blog, we really will talk about how to incorporate guided practice into the lesson. There are two more posts related to this topic. In the last post I will include a FREE lesson-planning check list to make sure you include all the important elements of an effective lesson plan. Stay tuned! Get a 20% discount when you buy two or more in a bundle. Get your school to purchase them for you! Is your school part of TpT for Schools yet? Keep up the good work and enjoy your Spring Break. Want notifications of free or new products? Make sure to Follow My Store.